Two events in the United States overshadowed all others in 2008 and still loom large as we enter 2010. One was the financial crisis that, spreading from America’s subprime mortgage mess, has stricken the global economy. The other was the election of Barack Obama to the United States presidency. Both events highlight the emergence of a new relationship between America and the world; both color every major event in geopolitics today. Central and South Asia win our attention by threatening to drag us all into chaos. Russia and China grab our notice by playing the great power game. Petroleum-exporting states like Venezuela hold oil consumers hostage, while financial fears consume the West. What does the Middle East have to do to make us pay attention? With the new administration in control in the United States, backed by same-party control of both houses of Congress, foreign affairs have taken a back seat to domestic affairs. The push in the U.S. to pull the economy out of recession, health care “reform,” and the now near-dead cap and trade legislation has reduced the Middle East to a footnote in the Obama administration’s policy agenda. But before we go any further, some background is needed on one of the underlying theories that drove U.S. and Israeli foreign policies, the Nash Equilibrium. John Forbes Nash, Jr. (the main character in the movie, A Beautiful Mind) is an American mathematician who worked primarily in game theory. In 1994, his life work on game theory won him the Nobel Prize in Economics. The precept that won him the prize was the Nash Equilibrium. The Nash Equilibrium is a kind of game involving two or more players, where no player has anything to gain by changing only his or her own strategy. Simply put, John Nash quantified the concept of “reciprocal altruism.” This is the concept of doing something good for an-other person without regard for repayment. The other, darker side of this theory is to attack anyone who attacks you, but harder. This “this-for-that” strategy had gained favor in the Bush ad-ministration even before the 2001 World Trade Center attacks. When the attacks did come, the thinking was, “You came here and attacked our home? We will come to your house and kill you.” This precipitated the attack on Al-Qaeda in Afghanistan. Afghanistan was only part of the equation. The Al-Qaeda group in Saudi Arabia was still a force to be reckoned with, but they had the protection of elements of the Saudi government and the Royal Family, who for the most part are one and the same. The United States government then was in a quandary. They didn’t want to invade Saudi Arabia, the leading exporter of oil to the United States, but they had to send a message. The invasion of Iraq at the time seemed to fit the bill. The Iraqi government was headed by a brutal dictator, was thought to possess weapons of mass destruction, and did not have many friends in the Muslim or world community. The United States needed to send a message to Saudi Arabia that we would invade a Muslim country and clean out Al-Qaeda if they would not do it themselves: Iraq was an object lesson for the Saudis. There was only one problem in the United States’ thinking. The Nash Equilibrium only works if both parties have some-thing equal to lose: “How do you win in a game of Chicken when your opponent thinks he will go to heaven if he loses?” The U.S. invasion of Iraq and subsequent invasion of Afghanistan produced many of the same results as the Soviet invasion of Afghanistan. It galvanized Muslim resistance against the foreign infidels. Terrorists from around the world poured in to fight the Allied troops. They believed that they were in Jihad and if they died, they would immediately enter paradise. For all the hand-wringing over the U.S.-led invasions, most countries were either ambivalent about the engagement or actually glad it came. Many European countries—especially the French, Germans, and Russians—saw it as a business opportunity. The Sunni-dominated Saudi government saw it as Iraq being removed as a threat to their oil supplies, as did the Shiite-dominated Iranian government. At first, the U.S. had the enthusiastic support of the Iranian government (even allowing our planes to land in Iran if they had mechanical trouble). This was because the Iranians were led to believe that the U.S. would support a Shiite-led government in Iraq, an Iranian puppet state, in effect. The Iranian government’s attitude changed once they saw the United States overtures to the Sunni faction in Iraq. It is interesting to note that Iran didn’t start talking about nuclear weapons until they began to feel like the U.S. was dealing them out of the game. In the beginning, the whole discussion was not about nuclear weapons, it was about Iraq. The history of Iraq goes back to Genesis 11 and Nimrod, the first world dictator. While today the capital is in Baghdad, Babylon is the center of history of that country. It is interesting that in these times the country that incorporates the Plain of Shinar has, once again, taken center stage. This is the mind-set of the Iraqi people. The insurgents know that Westerners are impatient, so they are willing to use time to their advantage. The insurgents think that all they have to do is wait and the foreigners will leave. Though the United States’ commitment to Iraq is far from over, it has reached a crossroads. While the U.S. was the major contributor of forces to the war effort, about 40 countries sent troops to fight in what was called “Multinational Force-Iraq.” As of this summer, however, only one foreign country’s forces remain in country—the United States. A name change in January 2010 will reflect the new reality, when the term “Multinational Force-Iraq” will be changed to “United States Forces-Iraq.” If there is an endgame in Iraq, we are now in it. Again, much of this is being forced by American impatience. Barack Obama the Candidate was a far different person than Barack Obama the President. President Obama has found that extricating the armed forces from Iraq is not as easy as it sounded in November 2008. He inherited a strategic plan from President George W. Bush that called for coalition forces to help create an Iraqi national military and security force that would be able to keep the central government’s authority and the country’s territorial cohesion and integrity. The strategy had, as a central premise, the belief that the Shiite, Sunni and Kurd factions in the country could cobble together a government in which all factions would participate and their interests were protected. While this government was forming, the United States would reduce its presence in the country un-til the summer of 2010, when the last of the U.S. military would leave. While the Obama administration continues to blame the previous administration for the current state of foreign policy, President Obama continues to faithfully follow the Bush Plan. A defining moment is fast approaching. While the Iraqi government is far from a first-tier fighting force, they are continuing to put their mark on the country. All the while, forces in-side and outside the country are reexamining their power-sharing arrangements and some are trying to disrupt the en-tire process. The two major players in this disruption are the Kurds and the Shiites. The major issue is oil. Iraq is a country of three distinct groups: the Kurds in the north, the Shiites in the central part of the country, and the Sunnis to the south. The Kurds have oil fields (and oil revenue) on their land, the Sunnis have oil on their land, and the Shiites have a lot of sand. The Sunnis (and the U.S. and Saudi Arabia) do not want the Shiites to control the government (and all the oil revenue). The Shiites (with 60% of the population) don’t want the minority Sunni (30%) to cut them out of power and oil. The Kurds (10%) don’t want to be governed by either group; they want their own country. (The Turks and the Iranians do not want autonomy for the Kurds in Iraq because it may give the Kurdish populations in their countries ideas.) The Russians desperately want the United States to fail be-cause they truly fear U.S. dominance in the region. All of this is centering on Kirkuk, 150 miles north of Baghdad. Kirkuk is the gateway into Iraqi Kurdistan. If the Sunnis control Kirkuk, they can project their power into Kurdistan. If the Kurds control it, it shuts down the Sunni threat and also cuts Sunni access to oil revenues in the region. If the Sunnis are shut out of the region, it can lead to being shut out of pow-er by the Kurds and Shia. To the north and west of Iraq is Turkey. Turkey is a volatile force in the Iraq equation. Iraqi Kurdistan is only part of the Kurdish homeland—Kurds also live in parts of Turkey (18% of the nation’s population), Syria (10%), and Iran (7%). It is the dream of the Kurds in these four countries to have a single homeland carved out of these four regions. If the Kurds in Iraq become too strong, Turkey may see this as a threat to their national sovereignty and may opt for a military response. This places the United States in a precarious position. In the last days of the Hussein regime in Iraq, the United States sup-ported a Kurdish insurgency in their area of the country. The Kurds allied with the United States, but also carried deep suspicions dating back to the previous Bush administration. During the First Gulf War, the administration of George H. W. Bush also worked with the Kurds to form a fifth column movement in Iraq. When the war was over, the United States left the Kurds to their own devices and they were slaughtered. Kurdish memories are long and they are afraid that George Bush the son would do the same thing that George Bush the father did. Today’s situation is further complicated by private investment by U.S. companies in Iraqi oil interests. A major shift in the political structure in Iraq could jeopardize those interests. Iraq is one insurrection away from becoming another Afghanistan. The third leg of the power triangle is the Shia. Shiite Prime Minister Nouri al-Maliki is of the same religious line as those in the Government of Iran, but he is not their puppet. Iraq has a long tradition of independence and do not march lockstep with anyone. The Iranian government is not happy with this arrangement and would like to see a regime change with a person more amenable to the interests of Tehran. To prevent this, the United States plans on leaving in country a substantial force of 35,000 to 50,000 troops in Advice and Assist Brigades (AAB), with no combat role, to enforce the agreements in place. These troops will be withdrawn gradually until December 31, 2011 when the last of the U.S. troops would leave Iraq per the agreement the Bush administration signed with the Iraqi government in 2008. It is hoped this plan will prevent Iraq’s neighboring countries, Turkey, Iran, Saudi Arabia, Syria—and ultimately Russia—from filling the void left by the United States. All of these countries, including Saudi Arabia, are hostile to the United States. Not only is keeping the troops in Iraq not an option, given our other commitments, but the uncertainty of Iran is problematic. With this option, the troops are as much a hostage to Iran as they are a guarantor. Previous diplomatic moves by the Obama Administration leave in serious question a forceful response to any Iranian move against these troops. Images of hostages being held by Iran for 444 days could be repeated, but on a much larger scale. 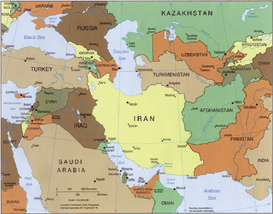 If Iran could be eliminated from the equation completely, the entire region becomes more secure. Short of a major move against Iran—by Israel or the United States—Iran will definitely have a part of the long-term peace process. Thus, the “nuclear issue” needs to be resolved. In Part 2 of this series we will discuss the status of Afghanistan and Iran.